The United States completely restructured its economy within months once it decided to enter World War II, changing the course of the war. We, too, can change the world, but we need to start now. The choice is ours—yours and mine—to either adopt Plan B and move the world onto a path of sustainability or go along with business as usual and allow further destruction of our natural support systems. The choice will be made by our generation, but it will affect life on earth for all generations to come. The following is a short list of political and personal actions that you can take to help move us in a sustainable direction. For more ideas, visit our People in Action page. In order to save our failing global civilization, there are two fundamental policy changes that must be brought to the attention of governments: restructuring taxes and reordering fiscal priorities. Lowering taxes on labor and increasing taxes on environmentally damaging activities will require markets to tell the ecological truth. Additionally, reexamining fiscal arrangements will allow governments to prioritize necessary resources for the Plan B budget. Elect leaders who support positive environmental and social initiatives. Contact or meet with your elected representatives and outline the Plan B goals and the need to create an honest market. Draft a statement of your concerns and a list of policies he or she should implement. Invite friends and community members to join you—the bigger your group, the more influence you might have. Raising environmental taxes and reducing income taxes. You can download information on tax restructuring from Chapter 13 of Plan B 3.0 here. Outline the elements of Plan B. (See key examples below.) Remind them that the dramatic U.S. mobilization for World War II is similar to what we need today to reverse the trends that are causing economic collapse and decline. 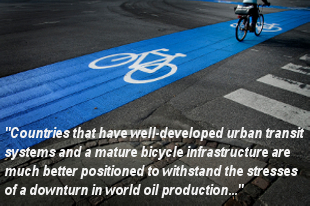 Such a mobilization can revitalize economies and increase job growth. Search the internet or visit your local library to find out how to contact your local politicians. U.S. residents can find federal and state officials by visiting www.congress.org or locate city mayors’ websites at www.usmayors.org. European residents can contact the European Parliament and European Commission. Click here to read some examples of how people have taken political action in their community. Everyone needs to take action in order to secure a sustainable future for our children and grandchildren. Encourage family members and community members to join you. Pick an issue that is important to you and focus on educating yourself and others about it. Then get to work on changing it. Below you will find some examples of causes we have highlighted. To find more information, search the Internet for environmental organizations or topics, or visit your local library for access to environmental books. Take some time to map out a plan of action for yourself and for your community along with a timetable for what you want to accomplish. Set your own goals and find people in your community you can work with to achieve them. A great way to educate yourself on environmental issues is to join an environmental organization or sign up to receive environmental news by e-mail. You can join our e-mail list by clicking here, or you can start your own to communicate useful information to friends, colleagues, and local opinion leaders. Write an opinion piece or letter to the editor for your local newspaper calling for action on environmental issues. Quick tips on writing letters or op-eds can be found on-line, including here and here (PDF) from Australian National University Professor Andrew Leigh. 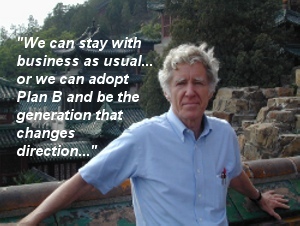 Here’s an example of an op-ed by Lester Brown, "Want a Better Way to Power Your Car? It's a Breeze." If you find our publications useful, share them with others. All of our books can be downloaded free of charge. Visit our books section. You can also distribute our EPI releases or download and share our powerpoint presentations. If you would like to reprint our materials in newsletters, e-zines, bulletins, etc. contact Reah Janise Kauffman at [email protected]. Click here for more examples of how people have taken personal action in their community. Having trouble picking an issue to stand for? Here’s a list of topics highlighted in Plan B 3.0. Each one is linked to more information from our Updates, Indicators, or other publications on our site. Banning new coal-fired power plants – Coal accounts for over 70 percent of the CO2 emissions from electricity generation. Recently, local communities, Wall Street investors, and politicians are backing away from coal. The same justification being used now to halt the construction of new coal plants can be used to shut down existing facilities. Phasing out coal power is necessary to stabilize climate and will also reduce air pollution. 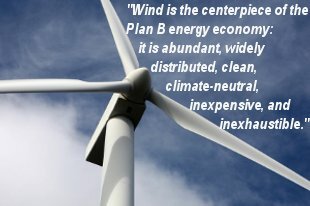 Harnessing the wind – Wind is the centerpiece of the Plan B energy economy. It is abundant, inexpensive, and widely distributed. A mass production of wind turbines would reinvigorate manufacturing capacity and create jobs. Production tax credits can help the wind compete with highly subsidized fossil fuels. Turning to the sun – The sun’s energy can be harnessed by solar photovoltaics and collectors for both heat and electricity generation. A global push for more solar rooftop water and space heaters would help cut CO2 emissions worldwide. No new nuclear plants – Nuclear energy is expensive to maintain and poses a serious threat to security. If we use full-cost pricing—requiring utilities to absorb the costs of disposing of nuclear waste, of decommissioning the plant when it is worn out, and of insuring the reactors against possible accidents and terrorist attacks—building nuclear plants in a competitive electricity market is clearly not economical. “Back-to-the-tap” anti-bottled water movement – Manufacturing the 29 billion plastic bottles used to package water in the United States alone requires 17 million barrels of oil. After they are used, more than four fifths of these bottles end up as garbage or litter. High-priced bottled water is often simply processed tap water. The movement away from bottled water involves a broad effort to reduce its use in schools, restaurants, companies, and government buildings. Redesigning cities and promoting mass transit – City planners are shifting their thinking from paving more roads for cars to building up urban transport, meaning less congestion and pollution. A “complete streets” movement—an effort to ensure that city streets are friendly to pedestrians and bicycles as well as to cars—is gaining momentum. Electrifying transportation: Plug-in hybrid vehicles and rail – Running cars and trains on cheap green electricity can free us from dependence on oil and help to stabilize climate. Now more than ever before, automakers need government incentives to manufacture highly efficient cars. Electrifying rail to move freight and link cities will reap further gains. Shifting from incandescent light bulbs to CFLs – If every person around the world were to switch from using conventional light bulbs to compact fluorescent lamps (CFLs), with office, industry, and traffic lighting changing to the most efficient technologies available, total world electricity use would fall by 12 percent—the output equivalent of 705 coal-fired power plants. Building green – Buildings are responsible for a large share of global electricity consumption and raw materials use, but people are thinking about how to make them better. Retrofitting existing buildings with better insulation and more-efficient appliances can cut energy use by half. A U.S.-based group of forward-thinking architects and engineers has set forth the Architecture 2030 Challenge, with the goal of reducing fossil fuel use in new buildings 80 percent by 2020 on the way to going entirely carbon-neutral by 2030. Universal basic education – Children without any formal education are likely to remain in poverty—with the gap between the poor and the rich widening. Supporting education for all children around the world can reap enormous gains in health care, equality, agricultural productivity, and economic growth. Ensuring global food security – We live in a rich world, but more than 1 billion people are hungry. Climate change, water stress, land deterioration, and a shrinking backlog of unused agricultural technologies all are playing a role in the slowing growth in world food supplies, all while populations are growing. Ensuing food security means tackling these challenges from all fronts. Food before fuel – Since converting increasing amounts of food into fuel for automobiles in recent years, the annual growth in world grain demand has more than doubled. With the owners of the world’s 910 million automobiles competing with the poorest 2 billion for food, more people are urging governments to reexamine their policies of subsidizing the turning of food into fuel. Reproductive health care and family planning – The benefits of providing reproductive health and family planning services far outweigh the costs of offering these services. Providing access to contraception and health care for all would lower the rate of unwanted pregnancies, induced abortions, and infant deaths, helping to stabilize the global population. Protecting and restoring forests – Ending forest destruction will involve reducing wood and paper consumption, boosting recycling, and providing alternative fuel sources to wood. Curbing the pressures to deforest stemming from population growth and the expansion of agriculture and rangelands is also important. Beyond protecting existing forests that are crucial habitats to wildlife, we can plant trees in deforested areas. Planting trees can help stabilize soils, prevent runoff, and remove CO2 from the atmosphere. Protecting plant and animal diversity – Humans have an enormous influence on the habitability of the planet for the millions of other species with which we share it. But if the world’s population increases to 9 billion by mid century as projected, countless more plant and animal species may simply be crowded off the planet. Raising water productivity – Low water prices present in many countries give the illusion that water is abundant when it is in fact scarce, and encourages wasteful water use. 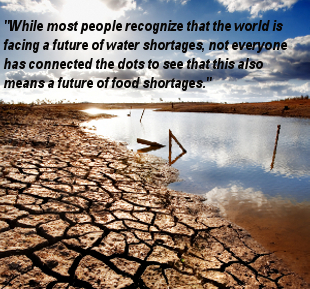 Because of this, water tables are falling at an accelerating rate around the world, putting additional pressures on food production. Shifting to more water-efficient crops and switching from flood irrigation to drip irrigation are two ways farmers can boost water productivity. Rethinking the materials economy – Our current “throwaway economy” is not only disrupting our environment, it is also wasting valuable energy and resources. Many products are manufactured with little intent for reuse or recycling. The big challenge is for cities to recycle the many components of garbage and for industry to produce easily-disassembled and recycled goods, since recycling uses only a fraction of the energy of producing the same items from virgin raw materials. Increasing efficiency in this way will keep our environment cleaner, while reducing carbon emissions. You can browse our publications by topic here, and get data on many key trends here.